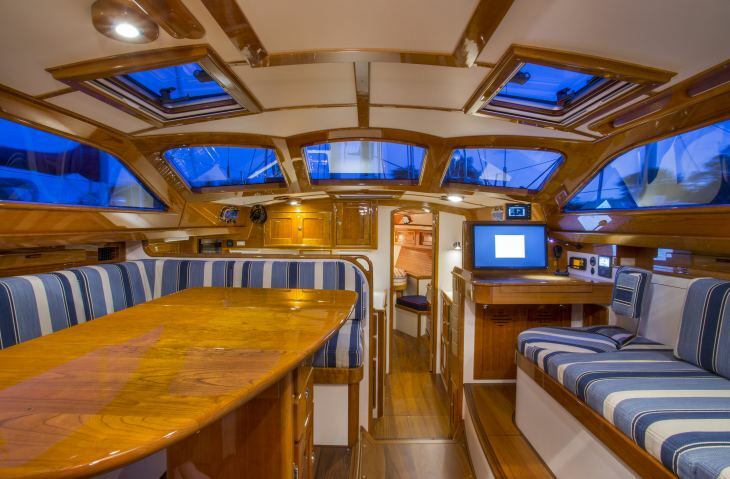 Victron Energy systems are at the heart of this stunning yacht pictured above. She is a hand crafted, built to order, Morris Yachts Ocean Series 48GT and we’re delighted that SAIL Magazine awarded her the 2015 Best Boat award, for her innovative electrical system design. Hopefully the photograph above conveys that ethos, but as we go below the hood as it were – What furthermore makes her so special, in terms of her award winning electrical systems? 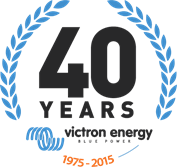 Victron Energy was founded in 1975 by Reinout Vader and like Morris Yachts a son (Matthijs) continues the family business. If we were to include C. W. Paine Yacht Design Inc, these three businesses have a combined experience of over 120 years. It’s that experience and pedigree that leads to innovation, ever improving and award winning design. In 2011 Reinout Vader wrote a small book called Energy Unlimited: Electricity on Board (And other off-grid applications). In this book (which is still available as a free download) Reinout details the benefits of the DC or Hybrid concept, which Morris use to good effect on their 48 GT. Here in Morris Yachts own words is a simple explanation of what in their view makes the DC concept so good. “You won’t need to worry about “charging your batteries” anymore. It’s all automatic. 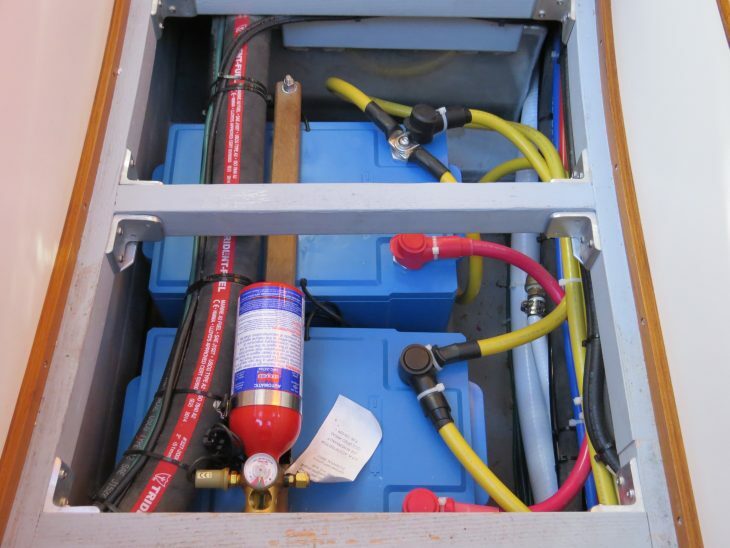 And the batteries charge faster than conventional batteries so you won’t have to listen to your generator run in that peaceful anchorage any longer than necessary. 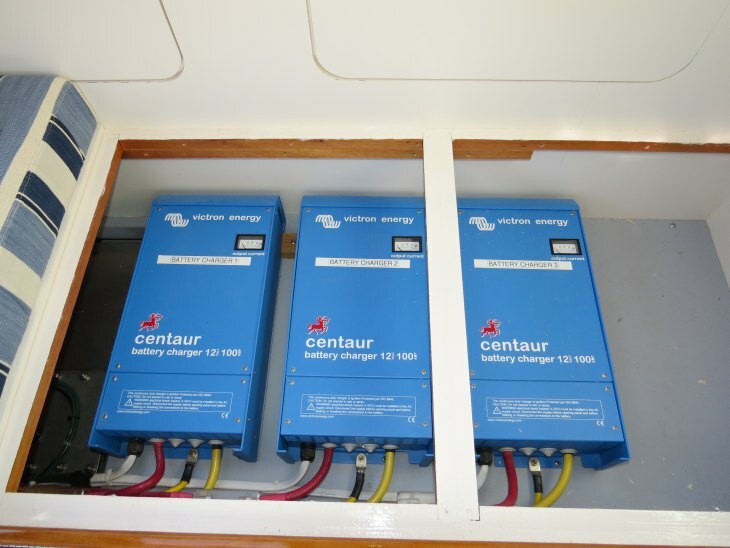 We came up with this outside the box solution by working directly with the owner as well as Victron Energy and Fischer Panda to design an electrical system that, unlike most conventional cruising boat systems, is 100% DC based. 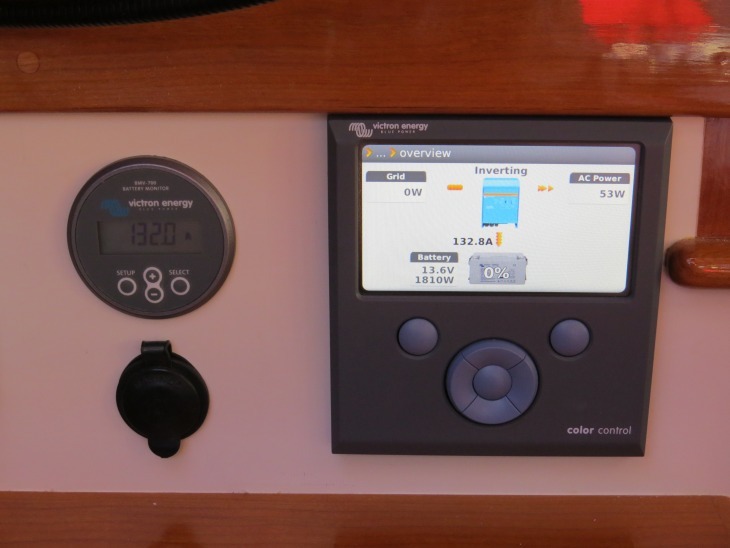 This means the boat has an extremely powerful battery bank and charge sources that use inverted DC power to run all AC loads on board. This elegant system incorporates a light yet durable 600 amp hour lithium battery bank, two 3,000 watt inverters, and multiple charge sources that are able to run all AC loads from the batteries. In order to keep the heart of this system charged—the lithium batteries—we installed a 5,000 watt Fischer Panda DC generator as the primary charge source. That means this generator doesn’t produce power to run the AC loads in the boat. It’s sole job is to charge the batteries that offer up to 275 amps of charge. The shore power does not directly run any AC equipment beyond battery chargers. A DC generator is much more efficient than a standard AC generator because it only runs when charge is needed, not whenever AC electrical loads are running. It’s also designed to start and stop automatically when the system senses charge is needed. There is no need for the owner to worry about when to start and stop the generator. 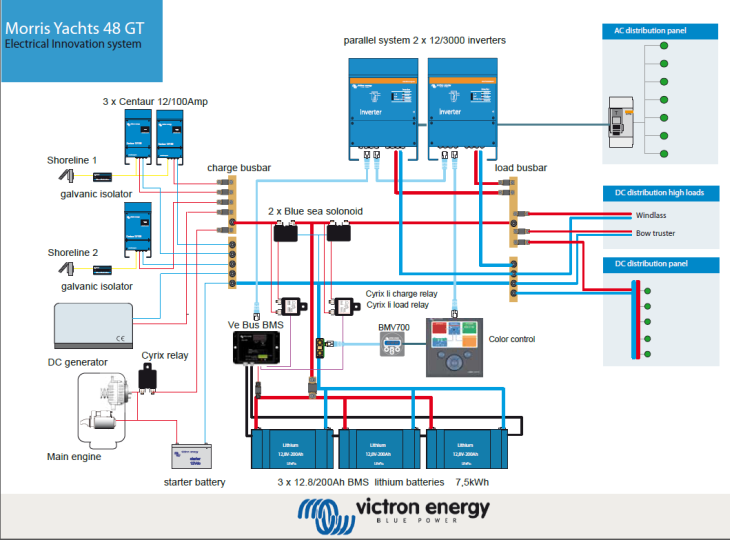 Owner brief: Design a 12V system that is “world proof”, providing 120VAC on board anywhere in the world. Many thanks to Susan James of Morris Yachts for the images used in this blog. 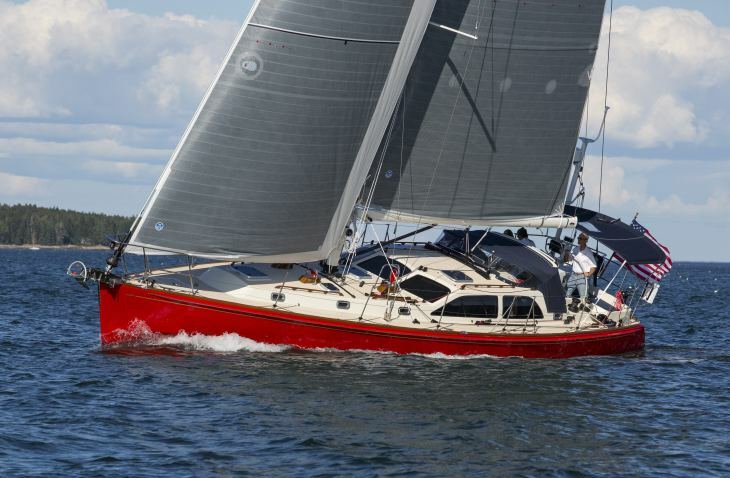 We wish Morris Yachts and the lucky owner of this innovative Ocean Series 48GT yacht every success. Grande Touring never looked so good.